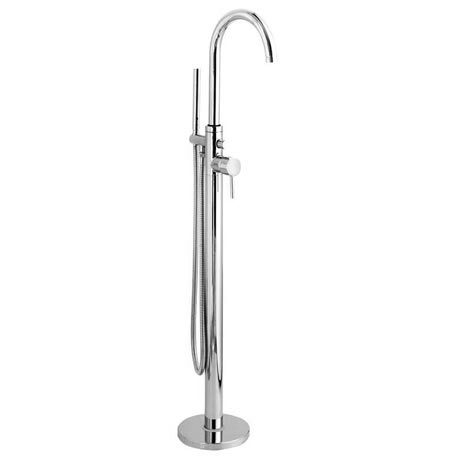 Tec Elite single lever mono bath shower mixer. This latest design concept is a truly minimalist addition to your bathroom. This combined bath filler and shower unit in a single column design is ideal for any free standing bath. Manufactured from solid brass and using the latest 1/4 turn ceramic disc valves this is truly a modern design classic that will still look stunning in years to come. We recommend a minimum operating pressure of 1 bar for best performance. Tec single lever bathroom taps provide fingertip control of flow and temperature with a stunning simplicity that proves beyond doubt that less really can mean more. We also offer co-ordinated showers. Supplied with handset and hose.